Until recently I’d never heard of the Caddy Lake Tunnels, let alone the fact that there is a 169 km (105 mile) round-trip canoe loop that starts on Caddy Lake in eastern Manitoba. For those of you short on time, the tunnels can be canoed as part of a day trip from Winnipeg. The tunnels are located in Whiteshell Provincial Park, near the Manitoba – Ontario border. They were blasted through solid granite rock when the railways were built, somewhere around the turn of the twentieth century. There are two tunnels, about three miles apart. I have been told that in some years when the water levels are really high, especially in the second tunnel, you have to portage the canoe or be prepared to lean way back and pull yourself along the tunnels with your hands. Fortunately, this past weekend, we had lots of head-space. We rented a canoe for the day from Green Bay Resort, located right on Caddy Lake. The beauty of this is you leave right from their beach. After our recent canoeing trip in the Northwest Territories, where we were buffeted by waves on a couple of the days, I figured this paddling would be a piece of cake. WRONG. The wind was blowing really hard and we had a lightweight aluminum canoe that was very hard to control. Crossing Caddy Lake on the way out turned out to be the toughest part of the whole day. After crossing Caddy Lake, I wasn’t sure I wanted to continue if the winds were going to keep blowing. But once you reach South Cross Lake, there are lots of little headlands you can duck in behind so the paddling is way easier. This is also where you’ll find some campsites – available on a first come, first served basis. Some are probably heavily used, but all that we saw were very pretty. The suggested paddling time to reach the second tunnel is three hours. We did it in about 2.5 hours, even with the wind. At our turn around point, just after we got through the second tunnel, we both wished we had more time to explore further. North Cross Lake is reportedly a beautiful lake – and the swimming is excellent. I was a little antsy about our return paddle as I figured the wind would be in our face and it would take three plus hours to get back (and we had a flight to catch and some photo ID that John had forgotten at the previous B&B to pick up). Fortunately the wind died down to almost nothing, but we did get caught in a downpour for about 45 minutes. Still, I’d take the rain over the wind any day. Over the course of our paddle we saw one muskrat, a turtle, numerous loons and many different types of ducks. Bugs were non-existent. We were back on the beach in two hours, so I guess all the paddling we’ve done this summer has paid dividends. This is a great day’s outing and perfect for families as well. If you’re not rushed for time, you could certainly paddle further than we did – providing you have the canoe back by 6 PM when the canoe rental part of Green Bay Resorts closes. On a side note, I’d like to recommend a stay at The Firefly B&B, just a few kilometers away from Rennie, and about 30 minutes from Caddy Lake. Your hosts, Doug and Patti, are some of the friendliest people you’re ever likely to meet. John and I were invited to join them for dinner on the deck – homemade thin crust pizza and a peach cobbler dessert. Their excuse was that they had a new outdoor pizza oven to try. The next morning we were also treated to fresh bagels from the pizza oven. I didn’t want to leave. The Caddy Lake area of Whiteshell Provincial Park is well worth a visit. I loved the landscape and would happily return for a longer trip. I can also recommend the cross-country skiing in the park. 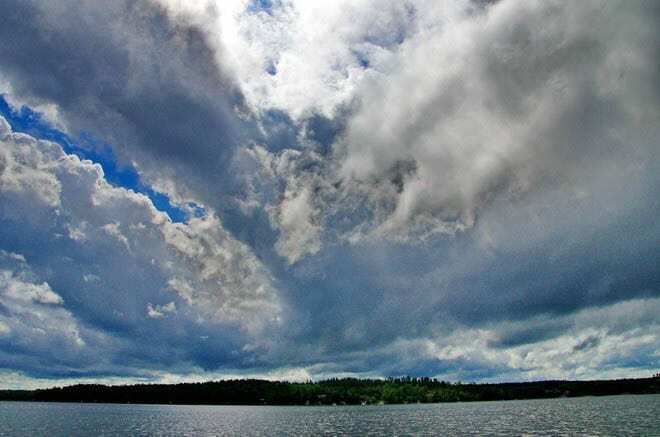 Have you visited Whiteshell Provincial Park? A big thank you to Travel Manitoba for help with some of this trip. I’m amazed at the variety in Manitoba. My perception of this province has totally changed. I’m keen to canoe this. @Jody We saw so much scenery over 4 days that I am also in awe at the variety. When it comes down to it, the prairies make up only a small portion of the province. The Peach cobbler in pizza oven looks delicious! The scenery looks completely different then I would have expected, beautiful. I love the tunnels. Very cool! We had a cottage at Star Lake for years (not from from Caddy Lake) but I’ve never heard of the tunnels before. Thx for sharing this post. We now live on lake Winnipeg, so I don’t get over to the Whiteshell very often, but will certainly share this post with some of my friends. Cheers! Wind can be a pain in the rear when paddling these big lakes. That is the one thing I don’t like about Quetico. Looks like a beautiful place to paddle for a day or two. @Matt It was much better than I ever expected – just wish we had longer. Wow what nan adventure! Would love to rent a boat and take it on those waters. @Rachel These waters were easier than some I canoes this summer – but it was an entirely different and very fun experience. Thanks for the info. I’ll be following your footsteps with my grandson in a week or two. @Mal Have a great time. I would truly love to do the whole loop.